When I was a nine year old giggling girl with bruised legs and untamed hair I got invited to my fair share of slumber parties. They weren’t really my thing. I could not understand why staying up late and talking was at all enjoyable and I never looked as cute in my pajamas as the other girls. But, there was an element to the sleepover concept which made the screaming, pranking and sleeping-bag sharing worth it. One of these giggling girl’s mothers would make gigantic bowls of sweet, crunchy, caramel corn for us. Sleepovers were no longer about the movies, the pranks or the rousing games of hide-and-go-seek; I was only coming for the caramel corn. Since then my love for the crunchy-salty-sweet corn has not decreased in the least but I have grown up a bit. That means we get fancy with toasted coconut and dark chocolate. My nine year old self wouldn’t have known what to do with this much goodness. 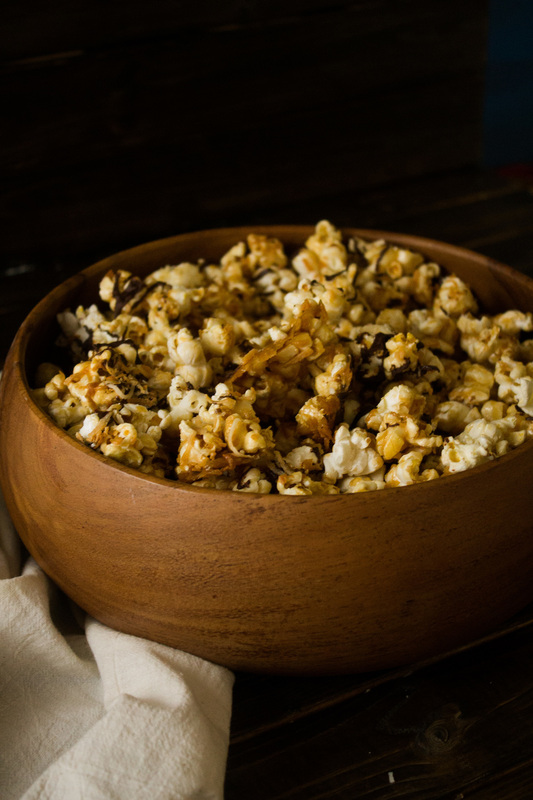 I popped my popcorn in coconut oil for extra flavor but if you only have vegetable on hand, that works just fine. If you have never made caramel before, this recipe is a good place to start - no candy thermometer required! This is your weekend snack, this is what you should eat when you’re binging on Netflix because you don’t get invited to sleepovers anymore. Happy weekending! On a baking sheet toast coconut slightly. Reserve for later use. Cover the bottom of a heavy pot with coconut oil and place over medium high heat. When the oil begins to shimmer add popping corn and cover with lid. When you no longer hear the corn popping, remove from heat. Transfer the popped corn to a large roasting pan and place in oven while you prepare the caramel. In a small saucepan combine butter, corn syrup, brown sugar and salt. Place the pan over medium high heat and stir until butter has melted. Bring the mixture to a boil and boil for five minutes without stirring. Remove from heat and quickly stir in baking soda and extract. Pour the caramel over the popcorn and toss until all the corn is coated evenly. Stir in toasted coconut. Return the pan to oven and bake for 45 minutes, toss with a wooden spoon every 10 minutes to ensure even cooking. Turn the popcorn out unto baking sheets and allow to cool. In a small bowl melt chocolate chips. Drizzle melted chocolate over popcorn and move baking sheets into the freezer for 5-7 minutes until the chocolate has just set. Break up popcorn and serve. Enjoy!